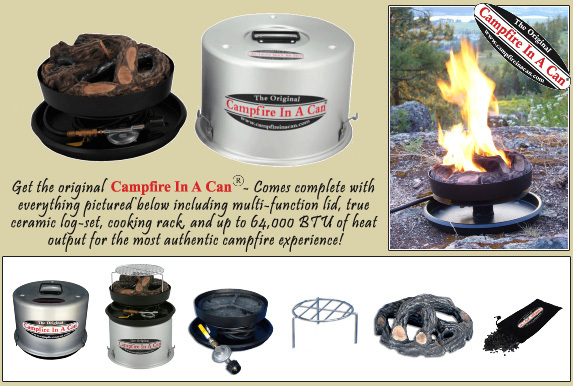 Other portable propane campfires just don't compare to the Campfire-In-A-Can! We recently did an independent comparison of all major propane campfire brands on the market and evaluated each model in 4 major categories including BTU output / flame profile, safety certifications, portability, and materials of construction. See our Campfire Comparison page for full details. As you will see, the Campfire-In-A-Can was superior in every single category! includes cooking rack - great for the coffee pot or skillet! less than 15 lbs! Easy to carry...easy to store! 10 ft. hose wraps up and stores inside the cover! Now, that's convenience!